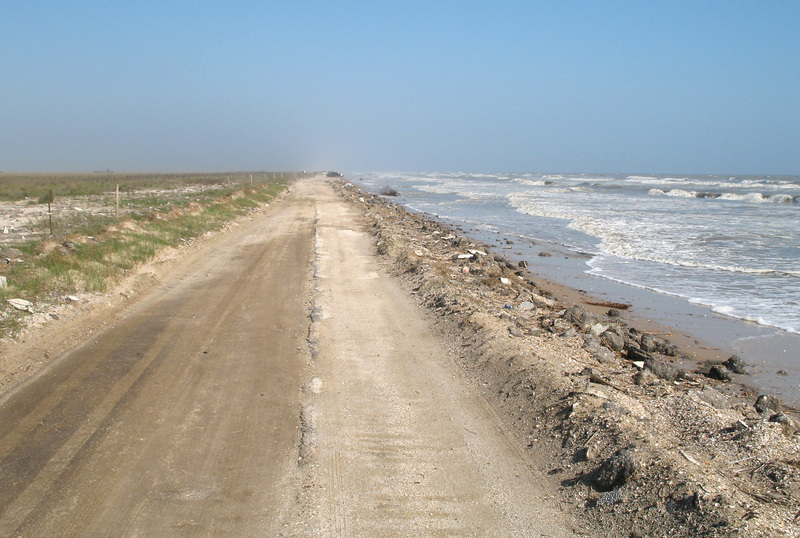 Previously I reported on SH 87, the washed-out coastal highway east of Galveston. 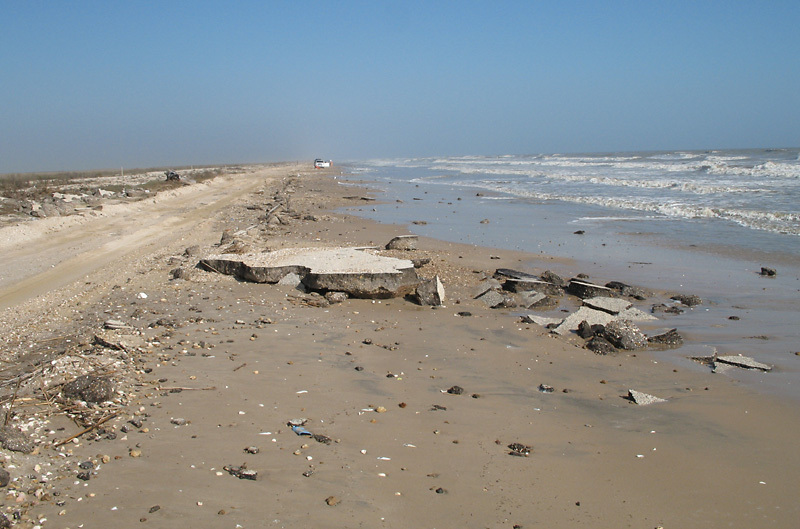 Hurricane Rita existed from September 17-26, 2005. For a brief time it was one of the most powerful storms in recorded history. Fortunately it fizzled and then veered away from Houston and Galveston. 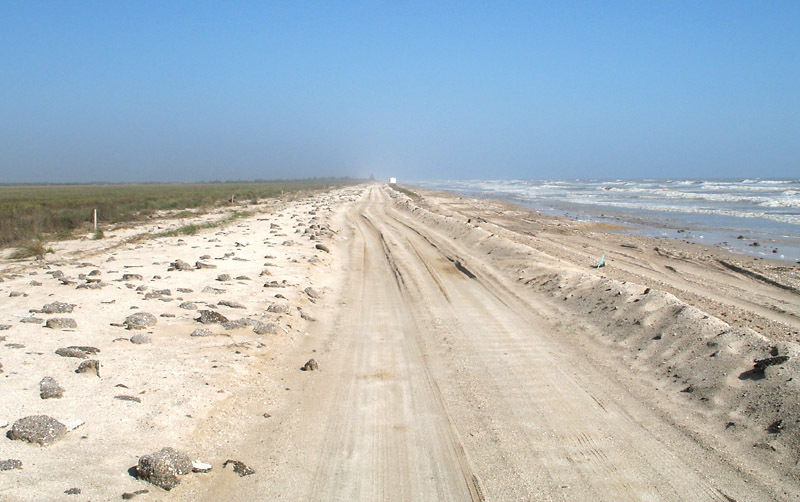 It did impart a soft hit on the section of coast where SH 87 once existed. 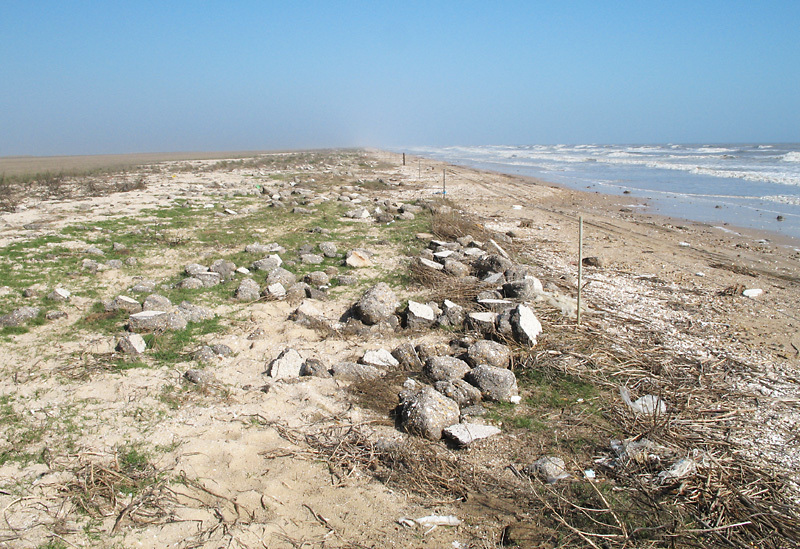 So, on November 27, 2005, I decided to take a trip to see how much erosion occurred on this section of coastline. 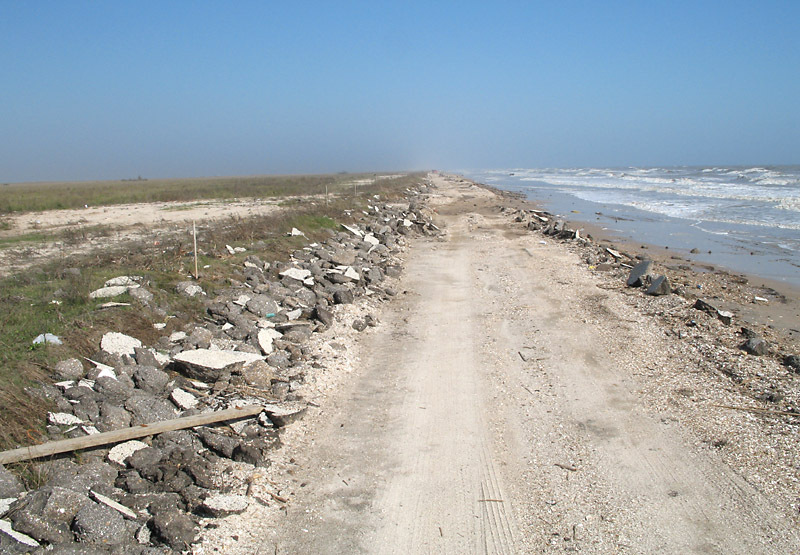 There was some obvious decay of the beach and vehicle trail since my last visit in January 2005, but I would rate the erosion as minor. 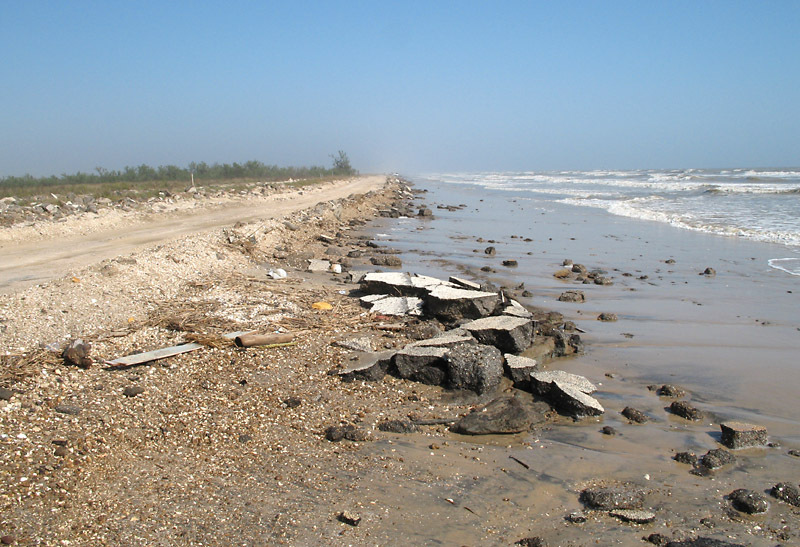 Only a minimal impact on the section of coast east of High Island. 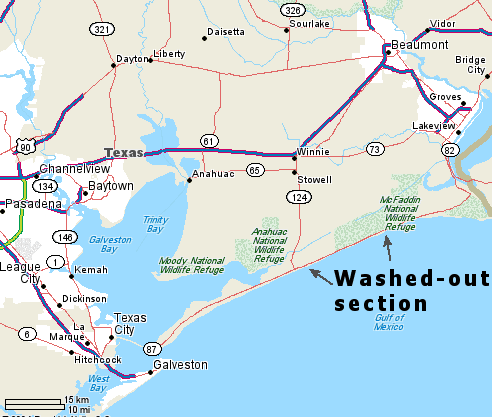 I didn't drive all the way to Sabine, where the impact could have been greater since it was closer to point where the eye of the storm hit. 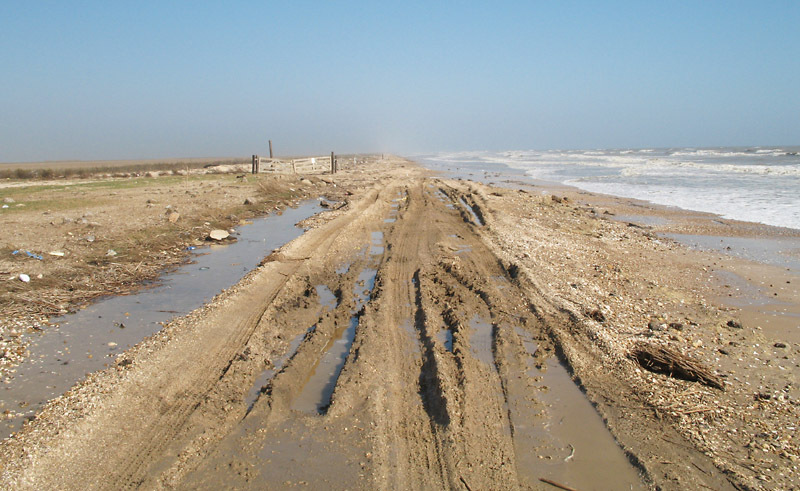 It has become more difficult to traverse the section east of High Island in a vehicle. In January 2005 we did it in an ordinary passenger vehicle. I don't think that would be possible anymore. 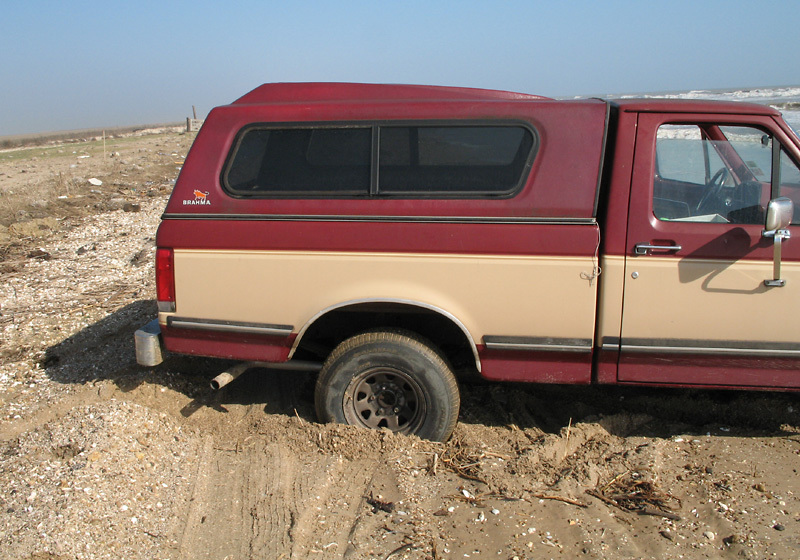 I was in a high-riding F-150 truck, and it was a risky drive since I had only two-wheel drive. Ideally, this section should be driven with a high-riding 4-wheel drive vehicle. 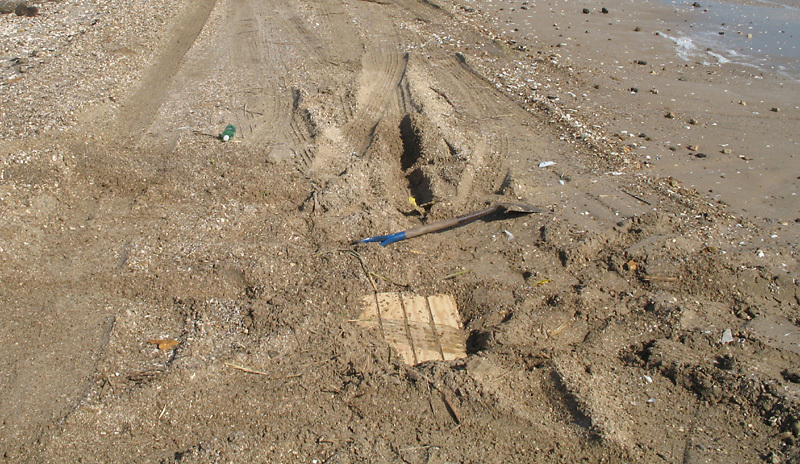 I managed to get stuck in the sand once, but fortunately I had a shovel with me. 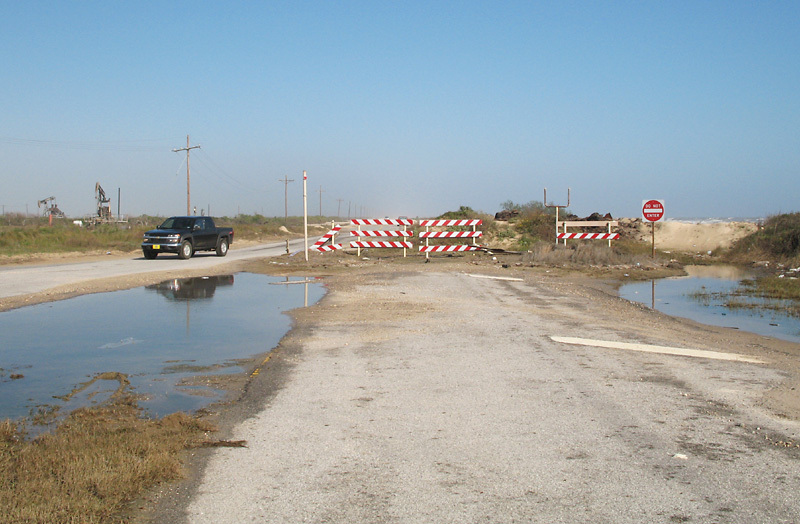 This is the barrier on SH 87 at the TX 124 intersection at High Island. It sustained minimal or negligible damage from Rita (it was already damaged before the storm). 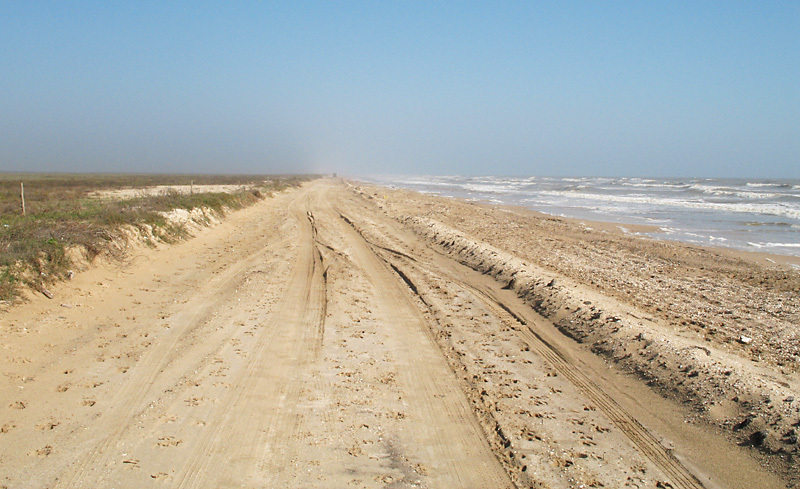 There is definitely more sand on the road than there was before Rita. 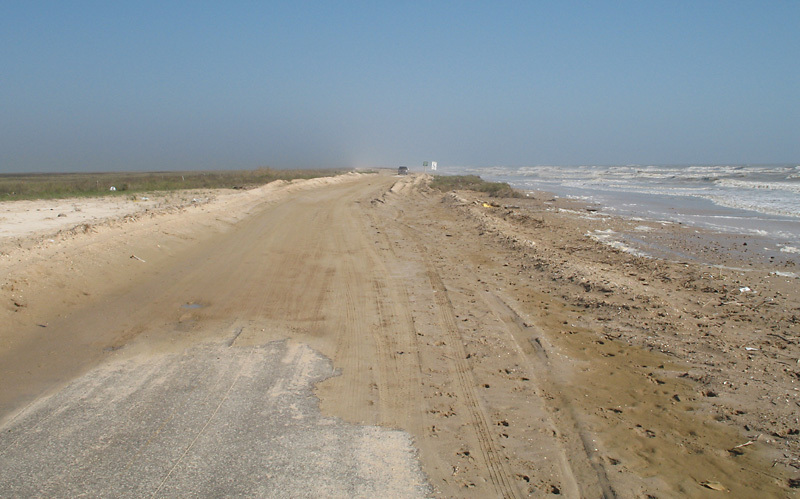 Here we see the last bit of pavement before the highway section ahead is engulfed in sand. Further ahead there is a section of intact pavement. 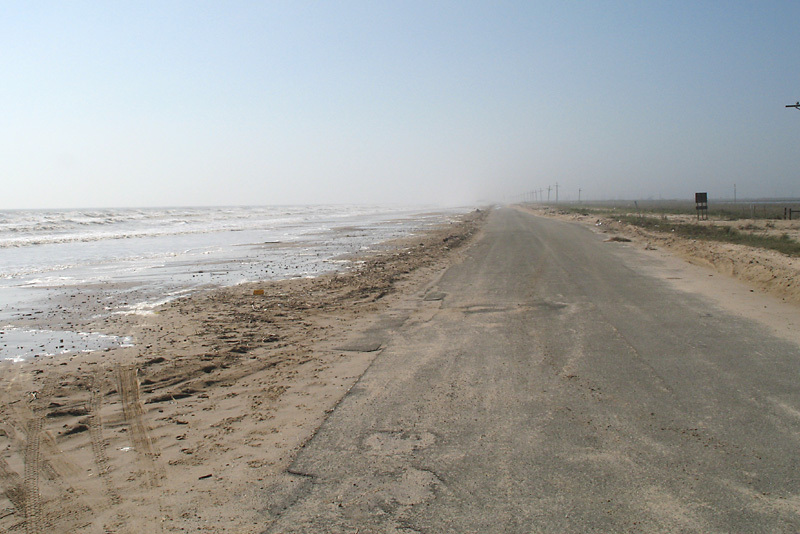 The waves are reaching the edge of the pavement, so it probably won't last long. Ahead there is no evidence of the road. (Click for high resolution) The road becomes visible again. Here we see the edge of the pavement, with chunks of asphalt piled up on the right. Chunks of asphalt are visible on the left. Here are some larger chunks on the waterline, to the right of the vehicle path. Another large piece of asphalt. A nice accumulation of asphalt chunks on the left side of the vehicle path. When I reached this point I decided to stop since the terrain ahead was muddy and it would be a risky drive. Just ahead (walking) I found this asphalt debris field. STUCK! Turning around didn't go as planned. Fortunately I brought a shovel and some boards. After a little digging I was able to get moving again.